*Please note that GLAMIRA offers customised products to its customers therefore the dimensions described here may differ depending on the product customisation such as preferred ring size, carat… etc. If the product options that you would like are not offered on this page, you can submit a form to request a quote for additional customisation. This price is up to 55% lower in comparison to traditional jewellery shops. You can select your delivery method at checkout. In the case of payment via bank transfer, the estimated delivery time will be calculated from the day that the payment has been received. The estimated time of delivery on this page is automatically calculated based on the production time and approximate shipping duration with the assumption that the order will be successfully processed today. The actual delivery date may vary depending on the shipping location and your payment status. Your order will be processed as soon as your payment transaction is completed. In case your payment transaction is delayed or the order is placed via bank transfer, the estimated delivery time will be recalculated from the date when your payment has been received. For more information about our delivery process, please read our Shipping Policy. 1. Your product will be dispatched within 24h from the date of order. 2. Once your order has been dispatched from our warehouse, you will receive an email with a tracking number. 3. Please note that the estimated time of delivery may vary depending on the shipping adress. Recommend this product to a friend ! This product can not be sold without chain. Leave a comment and share your Glamira experience with everyone! The photos you have taken with the product ordered will be posted here when you share with us. I agree to the use of my product photos for social networking purposes by GLAMIRA. 60 Day Return Policy We are committed to your satisfaction. Engraved or non-engraved; if you are not happy with your choice, return it in original condition within 60 days. 60 Day Resizing Policy Great things start with little details. 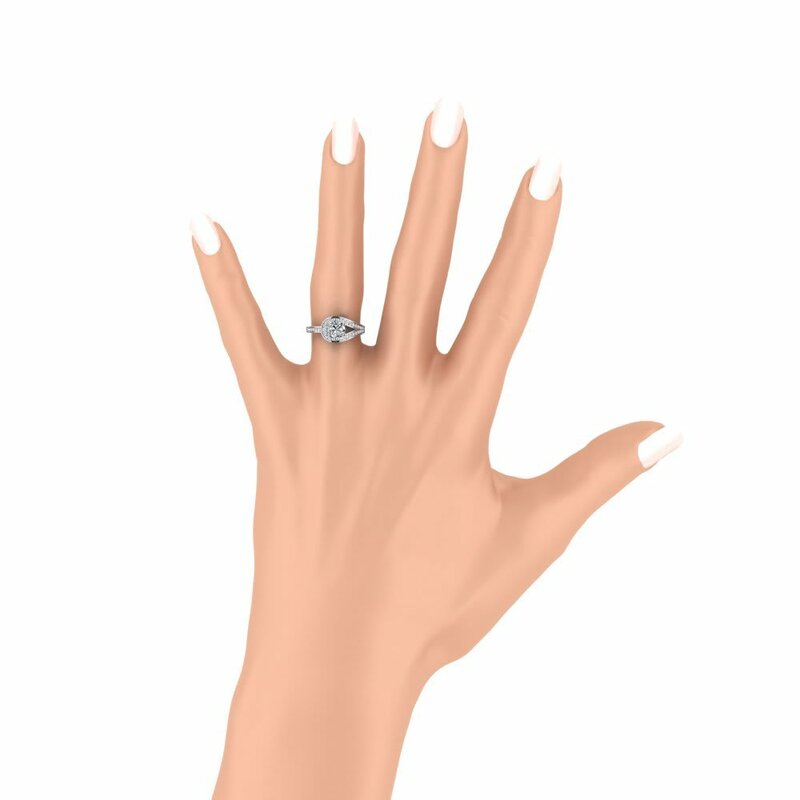 GLAMIRA will assist you with keeping the secret of a surprise and resize your ring, one time, free of charge within the first 60 days of receipt. Lifetime Warranty We stand behind the quality of our jewellery and provide lifetime warranty for all of our products. Every order is made and treated with care by our experts, from the very first second. Enjoy the quality of professional masterpiece and feel confident that your unique design jewelry will last a lifetime. 100% Satisfaction Oriented Customer Support GLAMIRA customer support team is happy to assist you throughout one of the most beautiful moments in your life. Our mission is your satisfaction; take your time to discover that perfect design, while we take care of everything else. Custom Made Jewellery Your special occasion is the most important thing to us and we understand how crucial it is to be ready for it. Devote your energy to choose a perfect masterpiece jewelry, and GLAMIRA will create it especially for you. Your purchase will also include a free fancy gift box, designed by professionals, because every little detail matters. Fast Delivery The timing is the keyword when it comes to organising a surprise for proposal or a wedding. GLAMIRA is proud to offer one of the fastest production and shipping time frames in the market. We also offer free delivery to all orders. Furthermore, if you would like to keep your order as a surprise, simply select the option of anonymous packaging during the checkout and we will send your product in plain packaging with no GLAMIRA logo on it. Authenticity Certificates for Brilliants and Gemstones Expert in-house gemologists carefully inspect all GLAMIRA diamonds & gemstones before they issue certificates for them. Every order comes with a certificate. If you are interested in GIA (Gemological Institute of America) certified diamonds, our customer support team will be more than happy to assist you. Allergy-Free Material The finest quality metals and stones used in our production are allergy-free. When it comes to wearing jewelry, comfort is as important as the jewelry itself. Our goal is to make sure that your personalized, unique design jewelry not only looks good, but also feels comfortable. Years of Experience Due to many years of professional attitude and striving to constantly improve our work, GLAMIRA has spread through many countries and have departments all around the world. Ordering from us assures a piece of jewellery that shows dedication to the field and years of experience. Founded in Heilbronn - Germany, delivering top quality since 2008 GLAMIRA roots established in Germany makes us different from other jewelers because of two main keywords: quality and punctuality. Established and tested processes throughout years of professionalism and disciplinary allow us to offer top quality service and jewelery. Direct from the source All gemstones and jewelry. Every step in a typical retail model influences the final price of the product. We are the manufacturer, covering all the phases involved in the process, from the very first touch of pen on the paper, till the product is handed to a courier. By refraining from dealers, importers, wholesalers and high street stores we are able to bring massive savings to our customers. Conflict free diamonds, gemstones and metals Precious metals and stones are often mined under horrendous conditions around the world. At GLAMIRA we guarantee that all diamonds, gemstones and metals used in the production of our jewellery are conflict free, originating from ethical sources and violence free regions in compliance with the Kimberley Process. Diamonds have been admired gemstones of desire since ancient times. Formed one hundred miles beneath the Earth’s surface over a billion years ago, diamonds are the hardest gem of all. It is also known as “the queen of the gems and the gem of queens”. In Glamira, it is guaranteed that diamonds are “conflict-free”. Classified as a semi-precious stone, Lemon Quartz fascinates jewellery lovers with its fresh colour. It is mostly found in a colour range from a clear lemon to a very vivid yellow. This stone is known for its powerful and high-energy feature that removes negative emotions, self doubt and that lifts the wearer’s mood and brings confidence. Classified as a semi-precious stone, Zultanite amazes with its unique colour-changing feature. Depending on the source of light and from different directions this very rare found gemstone is visible in different hues. Lime green in daylight and peach and cherry pink in dim light. Classified as a semi-precious stone, Green Topaz differs itself from the Blue Topaz with its green colour that is often associated with loyalty and love. It provides inner body peace, intellect and helps to solve problems and to get a good health. Classified as a precious stone, Green Sapphire owns it special colour from light mint green to dark rich green through the presence of iron. It is said that this rare gemstone is very soothing and that it calms the eyes and raises trust of the wearer. Classified as a precious stone, Orange Sapphire makes the heart of those loving the orange colour beat faster. It’s pale orange to reddish-orange colour calms your heart and mind, releases you from negative thoughts and activates joyful energies. Black Diamonds are the diamonds which have a different crystalline structure called as polycrystalline. It means that it's kind of like many diamonds smashed together. Since it is totally pure carbon crystal in its structure, it is generally called as "Carbonado". However, technically they are diamonds which are even harder and more rare than white diamonds. Classified as a precious stone, pink sapphire was considered extremely rare until new deposits were discovered in Madagascar, in the 1990s. Pink is among the rarest colours for a sapphire. These stones can come in all sort of shades, from baby pink to vivid, intense magenta. It is said that, pink sapphires represent loyalty, trust and sincerity, hence they are very popular when it comes to choosing a stone for an engagement ring. Classified as a semi-precious stone, the Rhodolite Garnet has quickly grown into a standard jewelry gemstone due to its attractive colour and the fact that it is often very clean, devoid of any flaws and inclusions. The name originates from the Greek word “rhodon” which means rose. In Hinduism it is associated with the root chakra and it is believed it encourages healthy sexual activity, feelings of stability and security. It also promotes successful business and helps with building self-confidence. One of the three available shades of the Topaz family semi-precious stones, London Blue Topaz is certainly special and exclusive for its dark color. With this darker shade, London Blue Topaz stands out and is adored by those who want everything except the ordinary. With its specific green tinge,and the dark grayish undertone, London Blue Topaz is perfect for the engagement rings if you want to show how extraordinary your love is. This is the gemstone which will not only catch everybody’s attention, but it is even said to make your communication and your expressive abilities stronger. Classified as a semi-precious stone, Morganite is considered as a natural, exceptional and sophisticated gemstone which can be found only in a few places around the world. Ironically, the price does not reflect its rarity. The most accurate description would contain words like rare, shimmer, durable, outstanding clarity and brilliance. Color that is naturally caused by the touch of manganese, might vary from a clear silvery pink, to peach and purple-pink, making Morganite exceptional and outstanding. Similarly to Green Emerald, Morganite is a symbol of divine love, which could be caused by the reason that both stones are the varieties of Beryl. An excellent choice for a unique engagement ring or as a present for that special life-time occasion. Classified as semi-precious stone, Amethyst is the purple transparent variety of the mineral Quartz. Amethysts most often derive their beautiful colors from iron impurities in their crystalline structures, though they can also be colored by natural radiation exposure. Classified as semi-precious stone, Green Tourmaline (Verdelite) is combined with numerous metals to form its boron silicate body which is one of the most complex crystal structures. It owes its emerald green colour to the chrome it has in its structure.The stone is believed to attract luck, success, abundance and prosperity. Classified as semi-precious stone, Citrine, derived from the citrine- a yellow fruit similar to the lemon- and meaning “lemon” in many languages, is the yellow and/or orange variety of Quartz. Being one of the most popular and affordable gemstones, it is associated with success and prosperity. Classified as precious stone, Emerald is a valuable gemstone; the deeper and more vivid in the color of green. Emeralds, among the rarest of gems, contain birthmarks which mean numerous inclusions and surface-reaching fractures. As the gem of Venus, Emerald symbolizes eternal youth and rebirth. Classified as semi-precious stone, Topaz is a stone found in huge and flawless crystals and can be faceted into thousands of carats gemstones. It varies in very occasions as colourless, yellow. With a good hardness combined with a relative abundance and availability, Topaz with a naturally blue color is very rare. Classified as semi-precious stone, Garnet is a combination of several closely related minerals having similar physical and crystalline properties. Garnets vary in colors and size. However, the mostly known color of Garnet gemstones is dark red and regarded as the stone of passionate devotion. Classified as precious stone, Ruby, being hard, durable and rare, is one of the most desirable gem. Even transparent rubies of large sizes are even rarer than Diamonds. The ruby has been a symbol of vitality and royalty for centuries. Classified as precious stone, Sapphire is a variety of corundum and a transparent, often blue gemstone associated with peace and happiness. It is second with Ruby to the diamond in terms of hardness. Classified as precious stone, White sapphire is a kind of sapphire in colourless form. A sapphire takes its colour from the trace elements when it is forming.That white sapphire is free from the touches of those trace elements makes it rare and unique. Classified as semi-precious stone, Quartz is provided widely from igneous and metamorphic rocks. It is often coloured as rose and smoky or by impurities. Classified as semi-precious stone, Rose Quartz is the rosy pink variety of Quartz. Being a soft colour, ranging from very light pink to medium pink in intensity. Classified as semi-precious stone, Smoky Quartz is the brown smoky variety of Quartz. It varies in color from light grayish brown to deep black. Classified as semi-precious stone, Tanzanite is a blue or violet gem variety of zoisite, containing vanadium. A recently discovered gemstone, Tanzanite has become one of the most popular and snazzy gemstone. It is believed to represent life. Swaroski is a small piece of crystal, cut in smooth and hard curves with high technology. What distinguishes it from the others is that its cut gives it a shiny semblance close to diamond when it is subject to light. Classified as semi-precious stone, Peridot, smaller than three carats are very common but the ones over five carats are rare and therefore have a higher value. The color of individual peridot gems can vary in the tints of green. It is said to bring the wearer power. Classified as semi-precious stone, Aquamarine is a gemstone which consists a light and bluish green variety of beryl. Its name speaks for itself; For centuries, this timeless gemstone with the colour of water has been a symbol of youth, hope, health and fidelity. Classified as semi-precious stone, the pink tourmaline, the most well-known and fashionable colour of tourmaline gemstone which has the largest colour spectrum. Therefore, it is known as the rainbow of all gemstones. Classified as semi-precious stone, Green Amethyst is light green quartz crystal. (known as Prasiolite). It owes its colour to either the heat treatment by volcanic activity or the natural heating of the earth’s core. Green Amethyst is a stone which promotes an intuitive capability coupled with love. Classified as semi-precious stone, Yellow Sapphire is a naturally occurring kind of Sapphire which is a variety of Corundum. Low iron content in Corundum is responsible for Yellow Sapphire’s hue. The stone is associated with fertility and good marriage. The pearl is the oldest known gem and has been considered the most valuable for centuries. What distinguishes pearl from other gemstones is that it is organic matter derived from a living creature - oysters and mollusks. Being called the 'teardrops of the moon', pearls can vary in colours; pink, white and black. The black onyx gemstone is a variety of chalcedony and it is a member of crystal class. It is a grounding stone, believed to keep the wearer related to reality, and cause the internal imbalances and outward negative energies to go away. Brown diamonds are brown coloured, fancy diamonds that are considered to be one of the most popular diamonds. The name ‘Brown’ has been given to these diamonds due to their chocolate-like colour. Having beautiful colour combinations; brown diamonds are also described as cognac diamonds or champagne diamonds, depending on their attractive colour range from light to dark. Brown diamonds are gemstones that are currently a growing trend in the jewellery industry. These diamonds are certainly your type of diamonds if you are a brownaddict and want to take a unique road on your journey to high end jewellery! Blue diamonds were first found in India and brought to the West in the 17th century. These alluring diamonds, carrying the hue of the oceans and skies, hold their extraordinary shade and certain set of characteristics. Similarly with any other coloured diamonds, blue diamonds can exhibit a wide range of tones, from pasty shades that recall a fair sky, to steel blue or to an intense deep sea. Names such as baby blue, royal, navy or midnight are also commonly used to classify these rare diamonds. Yellow diamonds currently own a high market demand amongst other coloured diamonds. Yellow diamonds can also be referred to as Canary, as in a Canary Yellow Diamond or occasionally as Zimmy. 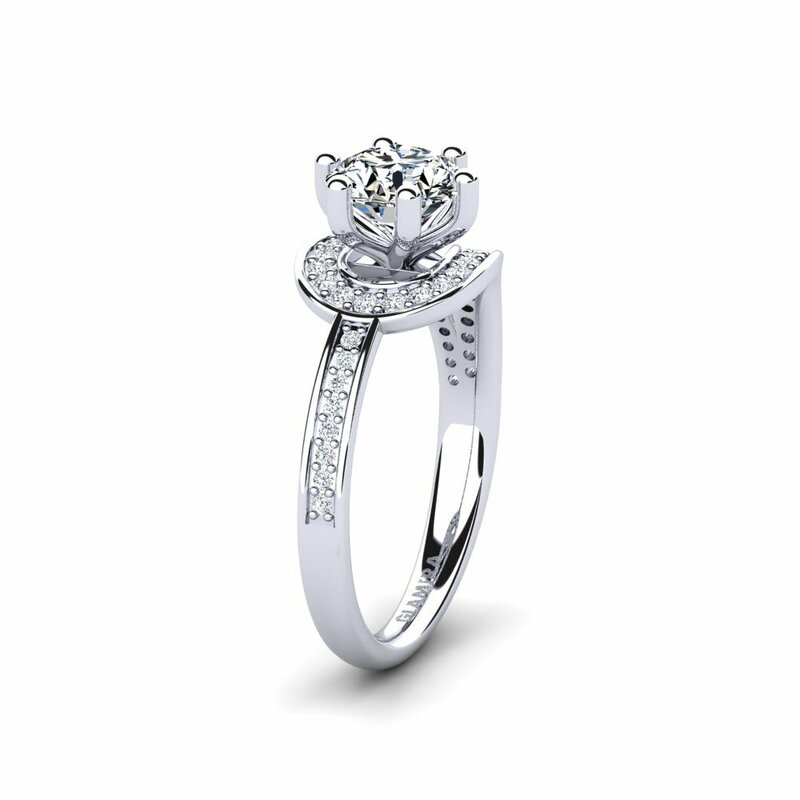 They expose a beautiful appearance when suited with halo and solitaire settings but can also be arranged elegantly with other settings as it has a very unique combination value due to its alive complexion. If you are interested in a yellow diamond, you certainly have many alternative settings to stunningly decorate this rare diamond with! Symbolizing nature, growth, harmony, endurance and fertility, Green Diamonds are highly valued and admired natural gemstones. There is a set of tones that a green diamond puts itself forward in. These tones will vary from Faint Green to Fancy Deep and all can be preferred accordingly with the wearer’s taste and desire. Green Diamonds are considered to be the most tranquil colour for the eye and contain a very strong emotional correspondence with safety. This may be the reason why many jewellery lovers opt for a green diamond not just on their rings but also on their earrings and pendants! The most sought after diamonds, Pink Diamonds are certainly all ladies favourite companion when it comes to jewellery! A dreamy color combined with the excellence of a carefully shaped and sorted diamond is a wish come true. Evoking a sense of luxury and romance, Pink Diamonds are spectacular additions to a woman's jewellery collection. Just as other coloured diamonds, Pink Diamonds also come in different hues from light to dark and these tones are referred to as faint, very light, light, fancy light, fancy intense, fancy deep, and fancy vivid. White Topaz is considered to be a semi-precious stone, a silicate mineral, carrying a high resemblance to the diamonds. Although less harder than them (8 on the Mohs scale), white topaz is celebrated for its clarity and transparency. The name for the Topaz comes from the Greek word ‘tapazos’, which means ‘to seek’. Probably it is no coincidence that White Topaz is said to assist spiritual healing, change negative thoughts into positive, to help you to find your route, your purpose and to provide you with the extra energy that is so needed sometimes. If you are looking for the jewelry with an eye catching stone, capable to provide the clearness and limpidity equal to the diamonds, white topaz most definitely can be the best choice. Dark blue colour with no ability to reflect light. Basic quality for fine sapphires. Medium intensity with a capacity to reflect a little bit of light. Contains slight inclusions, which may be visible to naked eye. High intensity in colour along with high brilliance. May contain very small inclusions that are visible to naked eye. Very intense colour along with extra brilliance. Difficult to find and known as the best quality for sapphire jewellery. Fair intensity with no ability to reflect light. Basic quality for fine emeralds. Fair intensity with a capacity to reflect a little bit of light. Contains slight inclusions, which may be visible to naked eye. Very high intensity along with extra brilliance. Difficult to find and known as the best quality for emerald jewellery. Dark red colour with no ability to reflect light. Basic quality for fine rubies. Very intense colour along with extra brilliance. Difficult to find and known as the best quality for ruby jewellery. Fair intensity with no ability to reflect light. Basic quality for fine amethyst jewellery. Moderate intensity with a capacity to reflect a little bit of light. Contains slight inclusions, which may be visible to naked eye. Very high intensity along with extra brilliance. Difficult to find and known as the best quality for amethyst jewellery. Diamonds contain slight inclusions, are noticeable under graded 10X magnification and visible to the naked-eye under close examination. Diamonds in this clarity group include slight inclusions that can be detected under 10X magnification mirror. Diamonds with this clarity contain very slight minor inclusions that can be seen under 10X magnification mirror and are not noticeable with naked-eye. Diamonds with this clarity may contain very, very slight inclusions, that are extremely hard to detect under 10X magnification mirror and not noticeable with naked-eye. These yellow diamonds has usually a light colour tone and low intensity. It is the minimum requirement for fine jewellery. With it's more vivid colour, it is certainly a more preferred yellow diamond. These yellow diamonds has a medium intense colour and slight darker shade. These yellow diamonds are definitely the most preferred choice when it comes to yellow diamonds. They have an intense yellow colour and are suited very well for fine jewellery. These yellow diamonds have the most intense and vivid colour. They are very rare and are suited for your finest jewellery. These blue diamonds has usually a light colour tone and low intensity. It is the minimum requirement for fine jewellery. These blue diamonds are definitely the most preferred choice when it comes to Blue diamonds. They have a intense blue colour and are suited very well for fine jewellery. These blue diamonds has the most intense and vivid colour. They are very rare and are suited for your finest jewellery. With it's more vivid colour, it is certainly a more preferred pink diamond. These pink diamonds has a medium intense colour and slight darker shade. These pink diamonds are definitely the most preferred choice when it comes to pink diamonds. They have a intense pink colour and are suited very well for fine jewellery. These pink diamonds has the most intense and vivid colour. They are very rare and are suited for your finest jewellery. These green diamonds has usually a light colour tone and low intensity. It is the minimum requirement for fine jewellery. With it's more vivid colour, it is certainly a more preferred green diamond. These green diamonds has a medium intense colour and slight darker shade. These green diamonds are definitely the most preferred choice when it comes to green diamonds. They have an intense green colour and are suited very well for fine jewellery. These green diamonds has the most intense and vivid colour. They are very rare and are suited for your finest jewellery. These brown diamonds has usually a light colour tone and low intensity. It is the minimum requirement for fine jewellery. With it's more vivid colour, it is certainly a more preferred brown diamond. These brown diamonds has a medium intense colour and slight darker shade. These brown diamonds are definitely the most preferred choice when it comes to brown diamonds. They has a intense brown colour and are suited very well for fine jewellery. These brown diamonds has the most intense and vivid colour. They are very rare and are suited for your finest jewellery. Green Swarovski Zirconia: Holds the same properties with green cubic zirconia. The difference is that Swarovski is a worldwide known brand for synthetic stones. Green Cubic Zirconia: Green Cubic Zirconia is often used as a substitute to emerald. However, it is a synthetic stone unlike emerald, which is a natural gemstone that comes in various shades and qualities. Swarovski Zirconia: Holds the same properties with clear cubic zirconia; colorless and bright. The difference from cubic zirconia is that Swarovski is a worldwide known brand for synthetic stones. Cubic Zirconia: Cubic Zirconia is a man-made material used as an affordable diamond alternative in jewellery for its durability and brilliance. This synthetic stone can be clear and colorless as well as in different colours and shapes. Dark Blue Swarovski Zirconia: Holds the same properties with blue cubic zirconia. The difference is that Swarovski is a worldwide known brand for synthetic stones. Dark Blue Cubic Zirconia: Blue Cubic Zirconia is often used as a substitute to sapphire. However, it is a synthetic stone unlike sapphire, which is a natural gemstone that comes in various shades and qualities. Red Swarovski Zirconia: Holds the same properties with red cubic zirconia. The difference is that Swarovski is a worldwide known brand for synthetic stones. Red Cubic Zirconia: Red Cubic Zirconia is often used as a substitute to ruby. However, it is a synthetic stone unlike ruby, which is a natural gemstone that comes in various shades and qualities. The "slight to very slight inclusions" are not visible to the naked eye and can only be seen under magnification. Refers to "very very slightly included" and it is known to be one of the highest grades, ranked under internally flawless and flawless. Fair intensity with no ability to reflect light. Basic quality for fine white sapphires. Very high intensity along with extra brilliance. Difficult to find and known as the best quality for white sapphire jewellery. Fair intensity with no ability to reflect light. Basic quality for fine pink sapphire jewellery. Very high intensity along with extra brilliance. Difficult to find and known as the best quality for pink sapphire jewellery. Fair intensity with no ability to reflect light. Basic quality for fine yellow sapphires. Very high intensity along with extra brilliance. Difficult to find and known as the best quality for yellow sapphire jewellery. Fair intensity with no ability to reflect light. Basic quality for fine citrine jewellery. Very high intensity along with extra brilliance. Difficult to find and known as the best quality for citrine jewellery. Fair intensity with no ability to reflect light. Basic quality for fine garnet jewellery. Very high intensity along with extra brilliance. Difficult to find and known as the best quality for garnet jewellery. Fair intensity with no ability to reflect light. Basic quality for fine blue topaz jewellery. Very high intensity along with extra brilliance. Difficult to find and known as the best quality for blue topaz jewellery. Fair intensity with no ability to reflect light. Basic quality for fine peridot jewellery. Very high intensity along with extra brilliance. Difficult to find and known as the best quality for peridot jewellery. Fair intensity with no ability to reflect light. Basic quality for fine aquamarine jewellery. Very high intensity along with extra brilliance. Difficult to find and known as the best quality for aquamarine jewellery. Fair intensity with no ability to reflect light. Basic quality for fine fire opal jewellery. Very high intensity along with extra brilliance. Difficult to find and known as the best quality for fire opal jewellery. Fair intensity with no ability to reflect light. Basic quality for fine green amethyst jewellery. Very high intensity along with extra brilliance. Difficult to find and known as the best quality for green amethyst jewellery. Fair intensity with no ability to reflect light. Basic quality for fine green tourmaline jewellery. Some small inclusions are visible with the naked eye. "Very Good (AA)" graded Green Tourmaline have a colour shade that makes some light penetrate the gemstone. Very high intensity along with extra brilliance. Difficult to find and known as the best quality for green tourmaline jewellery. Fair intensity with no ability to reflect light. Basic quality for fine pink tourmaline jewellery. Very high intensity along with extra brilliance. Difficult to find and known as the best quality for pink tourmaline jewellery. Fair intensity with no ability to reflect light. Basic quality for fine rose quartz jewellery. Very high intensity along with extra brilliance. Difficult to find and known as the best quality for rose quartz jewellery. Fair intensity with no ability to reflect light. Basic quality for fine tanzanite jewellery. Very high intensity along with extra brilliance. Difficult to find and known as the best quality for tanzanite jewellery. Fair intensity with no ability to reflect light. Basic quality for fine smoke quartz jewellery. Excellent (AAA) graded Smoky Quartz is high quality gemstone and can be found at world's finest jewelers. Most preferred choice when it comes to Smoky Quartz. Very high intensity along with extra brilliance. Difficult to find and known as the best quality for smoke quartz jewellery. Fair intensity with no ability to reflect light. Basic quality for fine morganite jewellery. Very high intensity along with extra brilliance. Difficult to find and known as the best quality for morganite jewellery. Fair intensity with no ability to reflect light. Basic quality for fine rhodolite garnet jewellery. Very high intensity along with extra brilliance. Difficult to find and known as the best quality for rhodolite garnet jewellery. Fair intensity with no ability to reflect light. Basic quality for fine tsavorite jewellery. Very high intensity along with extra brilliance. Difficult to find and known as the best quality for tsavorite jewellery. Natural, brilliant coloured ruby that wasn’t subject to heat-treatment process. This type of ruby has premium quality with minor inclusions that may be visible to the naked eye. Natural and highly intense coloured ruby that wasn’t subject to heat-treatment process. Recognised as the highest valued ruby. Natural, deep blue coloured sapphire that wasn't subject to heat treatment process. This type of sapphire has premium quality with minor inclusions that may be visible to the naked eye. Natural and highly intense colored sapphire that wasn’t subject to heat-treatment process. Recognised as the highest valued sapphire. Natural, vividly colored emerald that wasn’t subject to heat-treatment process. This type of emerald has premium quality with minor inclusions that may be visible to the naked eye. Natural and highly intensed coloured emerald that wasn’t subject to heat-treatment process. Recognised as the highest valued emerald. 375 Gold - 9K gold contains 9 parts gold and 15 parts another alloy metal(s), commonly varying in silver, copper, zinc, platinum or palladium, making it 37.5% gold. 585 Gold - 14K gold contains 14 parts gold and 10 parts of another alloy metal(s); commonly varying in silver, copper, zinc, platinum or palladium, making it 58.5% gold. 750 Gold - 18K gold contains 18 parts gold and 6 parts of another alloy metal(s); commonly varying in silver, copper, zinc, platinum or palladium, making it 75% gold. Silver is a precious metal and, much like gold, is too fine to be utilized in its pure form. To make silver durable enough for use in jewelry, pure silver, which has a 0.999 fineness (99.9%), is often alloyed with small quantities of copper or other metals (7.5%). The copper or other metals are added to strengthen the silver and the resulting product is 0.925 sterling silver (92.5%). Acceptable quality marks for sterling silver are sterling, sterling silver, ster, and 925. Considered among the most pure and precious metals used in modern-day jewelry making, platinum has become synonymous with luxury and longevity. Because of its hardness and durability, pure platinum is often mixed with other metals to make it more malleable. The most common alloy metals paired with platinum are copper, palladium, rhodium, iridium, and titanium. Four times stronger than gold, platinum is renowned for its hardwearing properties, resistance to damage and wear, and its substantial heft. Pieces marked with a 950 purity are a blend of 95% Platinum and 5% alloy metals (usually ruthenium, copper, cobalt, iridium, rhodium, or palladium). Only metals marked with a 950 purity designation are considered high-grade platinum. 950 Palladium alloys developed for jewelry typically contain 95% Palladium and about 5% Ruthenium and have trace amounts of other alloy metals. 950 palladium furthermore does not require rhodium plating, and has desirable, platinum-like setting and forming characteristics. Palladium falls within the platinum group of metals and shares the same chemical properties with Platinum, but is softer and more convenient in price. It can be used as a bleaching within the manufacturing of white gold. It’s natural, lustrous, and silvery - white colour does not need to be plated. 500 Palladium contains 50% Palladium and the rest is composed of other elements. The remaining metal alloys are usually silver and zinc. Platinum is considered the world’s most precious metal and it is very rare to see %100 pure Platinum as the remaining metal is usually composed of other elements. It is ultimately precious not only because of its exquisite beauty and durability but also because it is not easy to locate Platinum in many parts of the world. Did you know that in order to produce a single ounce of Platinum, a total amount of 10 tons of ore must be mined? 600 Platinum is equivalent to 60% pure Platinum while the rest of the metal is composed of other elements. At GLAMIRA we gather our metals, used in our production process, from the most trusted suppliers worldwide and with great care and value. Our customers place their credence in us therefore it is our utmost duty to provide them the excellence they deserve in the pieces we offer. Our bracelets for children are with adjustable chains that you can modify in accordance with the age of the child. The chain length can be adapted between 9-12 cm and 12-15 cm. You may refer to the chart below for a basic guideline to bracelet sizes for different age groups. Please note that this is an approximate measurement and the actual length that you need may vary depending on your child’s wrist measurement and your choice of a tight fit or loose fit. This product is available as a single earring and as a pair of earrings. Please note that if you select the pair option you will receive two identical earrings. Each gemstone grading has different characteristics such as color and clarity, describing the quality of the gemstone. The precise colour can vary depending on the chemical composition of the diamond. The colour-grading scale for diamonds ranges from D to Z. The highest colour grade and the whitest stone available is a D colour diamond. It is also the rarest colour grade and have a higher value. Diamonds in the G to J colour range have a hint of body colour and are considered Near Colorless. Ideal colour for a diamond is generally considered as H colour. Metal refers to the base material that is used to produce the jewellery. The colour is determined by the combination of the metal with the other alloying agents. Center stone is the primary stone on a jewellery.The carat of a center stone is larger than the other ones. Accent Stone is used to define the complementary or secondary stone(s) which are smaller in size generally but much more than stone 1 / gemstones. Gemstone clarity refers to the stone’s colour and clarity. The clarity for a gemstone depends on its type. The AAA clarity refers to very clean stones while the AA clarity refers to semi clean stones. Carat refers to the measure of diamonds and other gemstones. The term "Solid" indicates that the item is not hollow inside. Your product can be produced with or without a GLAMIRA logo engraved inside the shank. The shape describes a diamond’s form and appearance, such as round, princess, emerald or oval. All of these shapes have different forms and attributes. The shape describes a diamond’s form and appearance, such as round or oval. All of these shapes have different forms and attributes. A diameter (dimension) refers to actual appearance of a gemstone. Stone diameter is considered to measure the actual size of a gemstone better than a carat weight, due to the various cutting options. 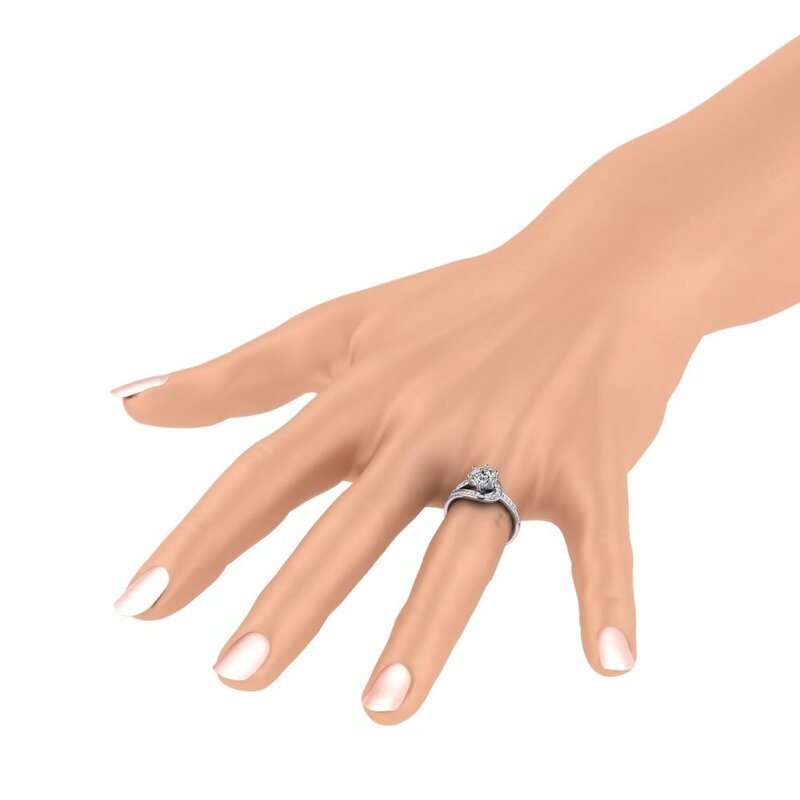 Ring thickness is measured in millimeters; vertically from the inside, against the finger, to the outside. It refers to the stones ranging from zirconia to diamond. It also includes their clarity and carat weights. It refers to the process of polishing, inlaying, granulation upon the facade of the shank. This refers to the wedding ring shapes including flat court, slight court and traditional court. Being flat on the outside and a light curve on the interior are typical characteristics of a flat court. 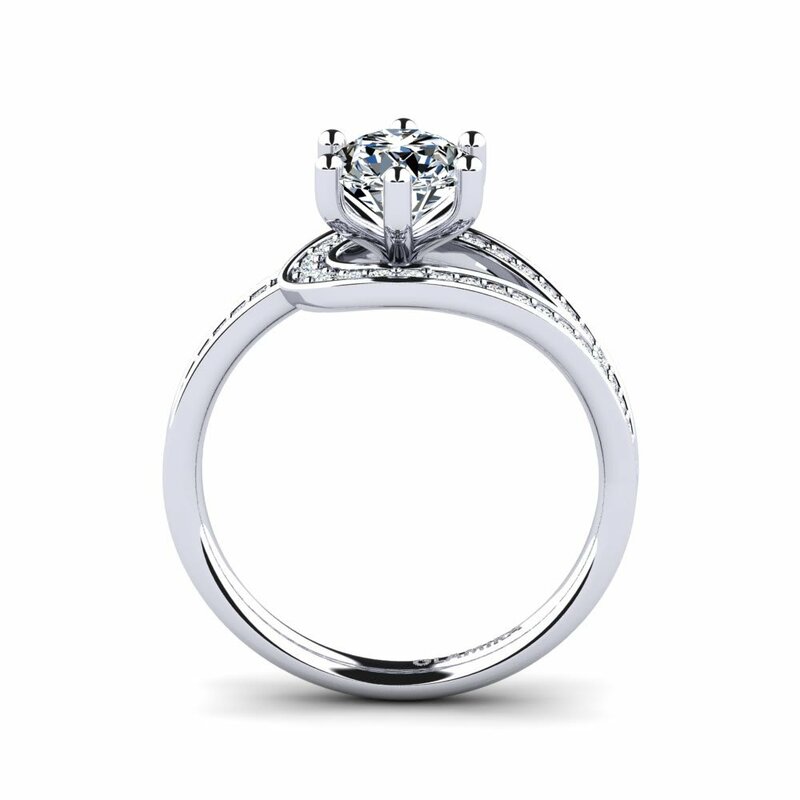 Slight court refers to the ring profile which is slightly rounded on the inner and the outer court. Traditional court is a heavy rounded inner and outer ring court. All GLAMIRA products are sent in stylish gift boxes. It is a mixture of different metals. As the combination of different ratios of metals, alloys modifies the properties of pure metals to produce desirable characteristics. As to the precious metals such as gold, silver, palladium or platinum, the manufacturing takes usually place after the metals have already been alloyed. Mixture of different metals might be in different colours such as white, yellow, red etc. GLAMIRA uses the laser engraving technique, which results in a smooth finish on the product. Engraving your item will not affect its eligibility for free resizing, lifetime warranty or repair. However, engraved items can only be returned for store credit and not for money refund. All GLAMIRA products are sent with a certificate of authenticity by GLAMIRA. You can also choose to have your diamond certified by GIA or HRD. If you have a particular choice between GIA and HRD, please contact our customer support after you have placed your order. Can't find your ring size here? If you are not familiar with this ring size scale, tell us your size in any international ring size format and we will make it for you! Enamel is basically a jewellery ornament applied with coloured glassy substance, translucent or opaque, fused to the surface of articles made of metal. How to modify your bracelet length? To gain a perfect fit, the length of the bracelet can be adjusted accordingly with the chain link attached to the clasp. How to modify your anklet length? To gain a perfect fit, the length of the anklet can be adjusted accordingly with the chain link attached to the clasp. The quantity of stones indicated here is for the ring sizes 14 and above. The amount of stones may decrease when smaller sizes are selected. The edge of the ring is curved outside for a stylish look and rounded inside for increased comfort. Quality of coloured diamonds is described by their characteristics such as color, clarity, cut and brilliance. Diamond quality (grading) describes the diamond's characteristics such as color, clarity and cut. Heated indicates that the gemstone has been exposed to heat treatment for color/clarity enhancement. It is considered a natural type of treatment as it is the continuation of the process where the gemstone was initially formed in the earth. Unheated indicates that the gemstone has not been exposed to heat treatment and the color/clarity characteristics are natural. African emeralds appear in cooler and lighter tones. A little bit darker inclusions may be spotted on these stones. Colombian emeralds have a warmer tone. Their colour is more intense and pure green accompanied with high clarity. These emeralds are the most valued and popular ones, having very fair inclusions. The given weight information is approximate and based on size 22 1/2. Selected quality will not appear on product image. D: D diamonds are the finest white and colorless; the rarest color grades and have the highest value. E: E diamonds are the second highest color grade in “colorless” range. E diamonds are referred as rare white and extremely fine. F: F diamonds are on the last grade of “colorless” scale and considered as rare and fine white diamonds. G: G diamonds are on the first place to “near colorless” range; are very valuable. They contain slight traces of white color. H: H diamonds are on the “near colorless” range and slightly colored. The color on the H diamonds can only be detected when compared with other colorless diamonds. I: I diamonds are slightly tinted and considered as “near colorless”. The slight color on the I diamonds may be detected. J: J diamonds are considered as on the last scale of “near colorless” range. The slight white color of J diamonds can be detected. K-Z: K-Z grade diamonds are considered as slightly colored to colored diamonds; from light yellow to yellow. FL - IF: This clarity grade is considered from flawless to internally flawless. These diamonds do not contain any inclusions. Internally flawless diamonds may only have faint external blemishes, can be removed by repolishing. Flawless and Internally Flawless diamonds are very rare. VVS1 - VVS2: Diamonds with this clarity may contain very, very slight inclusions, that are extremely hard to detect under 10X magnification and not visible to naked-eye. VS1 - VS2: Diamonds with this clarity contain very slight minor inclusions that can be seen under 10X magnification and are not visible to naked-eye. SI1 - SI2: Diamonds in this clarity group have slight inclusions, can be detected under 10X magnification. I1: Diamonds have slight inclusions, which can be seen under graded 10X magnification and visible to the naked-eye under close examination. 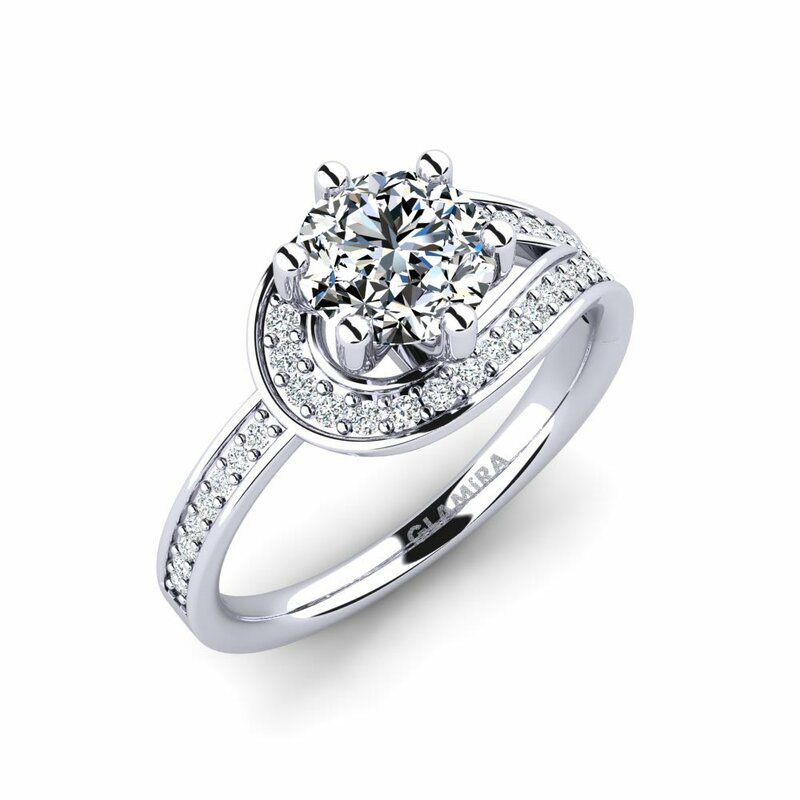 I2 - I3: Diamonds contain obvious inclusions that may affect the brilliance of the diamonds. Inclusions on these diamonds are visible to naked-eyes. Excellent: Diamonds in this scale, are on the first place of all range settings and are very rare considering of their perfect interaction of facets and light. These diamonds reflect the light best and glitz intensely among all the diamond categories. Very Good: Diamonds in this range are considered as having the highest cut grade. The interaction of facets shows a good balance and deliver fire and brightness in a diamond. Good: Diamonds in this range give less fire and brilliance when compared to the ideal cut diamonds and deliver slight darkness. Fair : Diamonds in this range produce limited light and brilliance. You can choose from three options for the length of your chain. Please click the size options above to view the difference between them. Every Glamira brand ring is engraved inside with our logo, as shown in the picture. Choose whether you´d like our logo engraved inside the band. How do we keep our prices low? Long term cooperation with reliable suppliers for ethical sources. Click here if you would like to learn more about our pricing policy. Do you have a question about this product? Our Customer Support Team will gladly assist you on your enquiries. Characterization: "Good (A)" graded Smoke Quartz have small inclusions. Light does not penetrate through the gemstone. Entry level for fine jewelry. Some small inclusions are visible with the naked eye. "Very Good (AA)" graded Smoke Quartz have a colour shade that makes some light penetrate the gemstone. Excellent (AAA) graded Smoke Quartz is high quality gemstone and can be found at world's finest jewelers. Most preferred choice when it comes to Smoke Quartz. Traditionaly Heirloom (AAAA) graded Smoke Quartz gemstone were used by royalty. These gemstones has the highest clarity, flawless and the richest colour. Characterization: Cubic Zirconia is a man-made material used as an affordable diamond alternative in jewellery for its durability and brilliance. This synthetic stone can be clear and colorless as well as in different colours and shapes. Holds the same properties with clear cubic zirconia; colorless and bright. The difference from cubic zirconia is that Swarovski is a worldwide known brand for synthetic stones. Characterization: Green Cubic Zirconia is often used as a substitute to emerald. However, it is a synthetic stone unlike emerald, which is a natural gemstone that comes in various shades and qualities. Holds the same properties with green cubic zirconia. The difference is that Swarovski is a worldwide known brand for synthetic stones. Characterization: Red Cubic Zirconia is often used as a substitute to ruby. However, it is a synthetic stone unlike ruby, which is a natural gemstone that comes in various shades and qualities. Holds the same properties with red cubic zirconia. The difference is that Swarovski is a worldwide known brand for synthetic stones. Characterization: Blue Cubic Zirconia is often used as a substitute to sapphire. However, it is a synthetic stone unlike sapphire, which is a natural gemstone that comes in various shades and qualities. Holds the same properties with blue cubic zirconia. The difference is that Swarovski is a worldwide known brand for synthetic stones. The average ring size varies between 12-14 for women and 18-21 for men. If you are not sure about your ring size, don't worry! 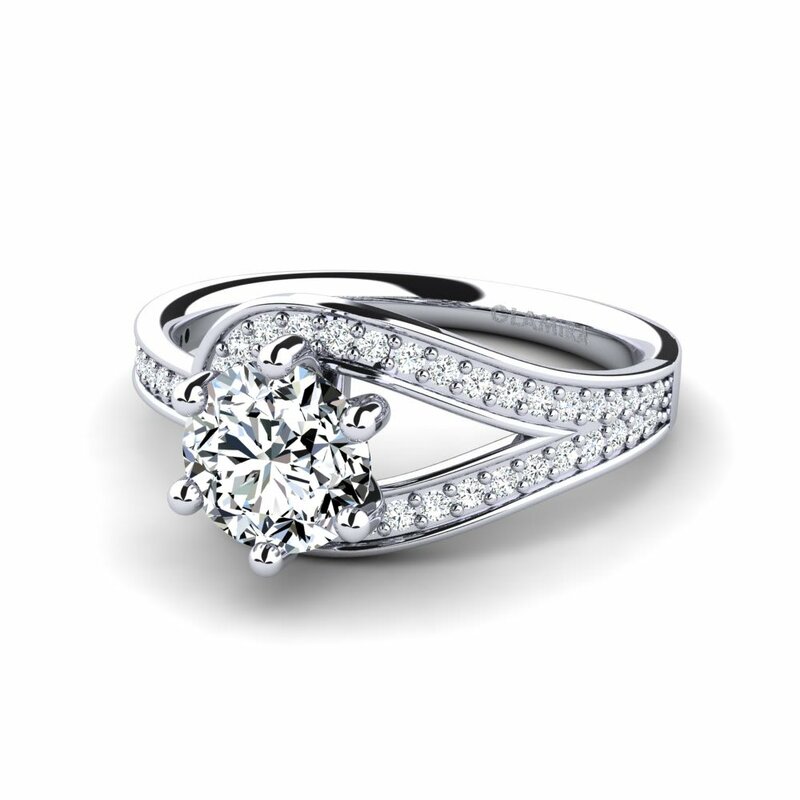 GLAMIRA will gladly resize your ring one time free of charge within 60 days of delivery. 1. Print a copy of our free ring sizer by clicking on the link, follow the simple instructions and determine your ring size. 2. You can order Glamira ring sizer for free by sending an email including your name and your address to with a subject "Order a ring sizer", or you can fill in the form. For further details you can check our ring size guide. You can also contact us at . Our customer support team will be happy to assist you!